Andrew is a data editor at TrendCT.org and the Connecticut Mirror. 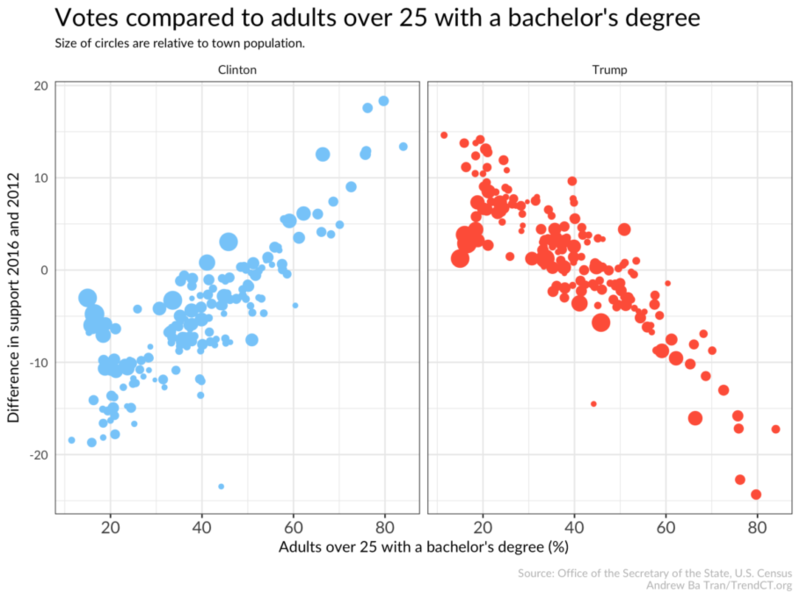 He teaches data visualization at Central Connecticut State University as well intro to data journalism at Wesleyan University as a Koeppel Fellow. He was a founding producer of The Boston Globe's Data Desk where he used a variety of methods to visualize or tell stories with data. Andrew also was an online producer at The Virginian-Pilot and a staff writer at the South Florida Sun-Sentinel. He’s a Metpro Fellow, a Chips Quinn Scholar, and a graduate of the University of Texas. Since 2010, Connecticut has grown in population by about 1.3 percent and median household income has decreased about 4.5 percent after adjusting for inflation, according to new figures released by the U.S. Census today. The number of undocumented immigrants living in Connecticut declined by about 10,000 in 2014 to 120,000, according to an analysis recently released by the Pew Research Center. The number of foreigners living in the state without proper documentation climbed from 20,000 in 1990 to a peak in of 130,000 2008 and had remained level through 2013. Connecticut folks moving south and west, out more than in from U.S.
Connecticut welcomed 77,000 new residents between 2015 and 2016, but said goodbye to about 103,000, according to new domestic migration figures released by the U.S. Census. Here’s a closer look at the numbers to see what this election, when compared with the results of 2012, revealed about the voting public’s character and mood. Voter turnout this year fell across the country for this past election but not in Connecticut. Trend CT estimates that about 76 percent of active voters participated in this year’s elections. That doesn’t exceed 2008’s record of 78.1 percent when President Barack Obama faced off against John McCain, but does pass the 2012 mark of 73.8 percent. Nine or 10 towns flipped from supporting Mitt Romney in 2012 to voting for Clinton this year— most notably in the Southwest part of the state that has tended to lean Republican in previous elections. Donald Trump, on the other hand, won over about 40 towns in the middle of the state. 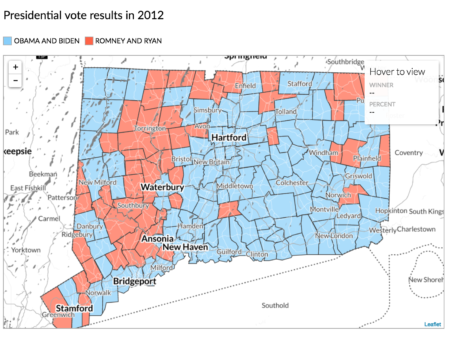 Here’s a refresher on how Connecticut towns leaned for the presidential candidates in 2012.